From a Kidsgrove Scouts press release: The Kidsgrove Scouts, from Staffordshire, England, are pleased to be celebrating their 95th anniversary during the upcoming 2005 season. To mark this historic achievement, the corps Web site has been reorganized and provides details of historical developments of the corps as well as information on the 2005 production, "The Conquest." During this celebration year, the corps will be taking part in both Drum Corps Europe (DCE) and Drum Corps United Kingdom (DCUK) competition, traveling to Belgium and Holland as well as performing at various locations around the UK. Corps coordinator Robert Swindells said, "The corps is very excited by the upcoming season. The winter programme is currently going very well and we are looking forward to presenting the 2005 show to audiences in both the UK and Europe." 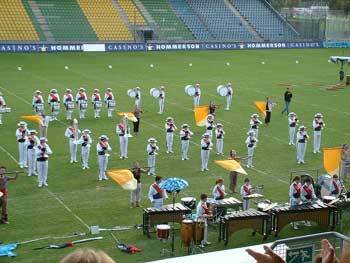 For more details about the 2005 season, please log onto the Kidsgrove Scouts Web site.